Good thing those banana peels are virtual, huh? In Japan, a gent named Ken Kawamoto used projection mapping and Romo, a robot that's controlled via iPhone app, to "recreate Mario Kart" in the living room. Kawamoto calls this "Romo Kart." As noted on Hack A Day, there's a Xtion motion sensing camera and a video projector hanging from the ceiling, which track the Romos. The room is scanned and then a course is generated based on the objects in the room. 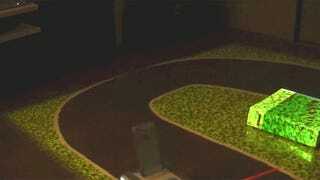 The projection mapped game has Mario Kart-style items like banana peels, and there are also power-ups. Kawamoto says there are plans to release the source code "when we find the time."